A view of the L-shaped home at night. The steep pitch of the roof is traditionally Danish. Instead of tile, however, the house has a galvanized aluminum standing-seam roof with skylights. 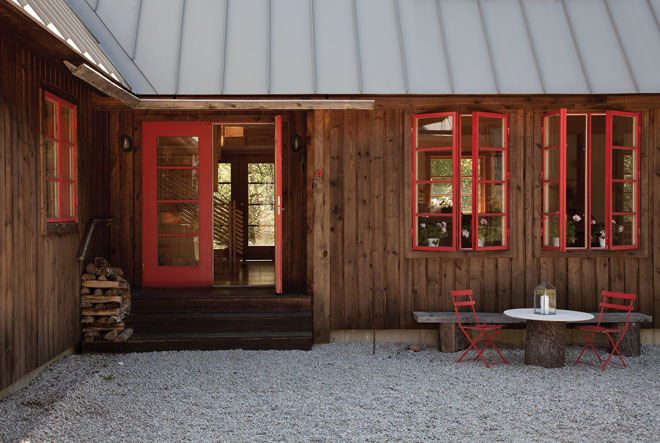 The front entrance to Kenna Haines’s home has some typically Scandinavian features, like red window frames, reverse board-and-batten siding, and gravel (which might be cobblestones in a Scandinavian country) in lieu of grass. On the right, there are two bistro chairs around a table composed of a tree trunk and a marble top. The hurricane lantern is from the L.L. Bean Home Store in Freeport. The ceiling and floor of the living room are clad in spruce. 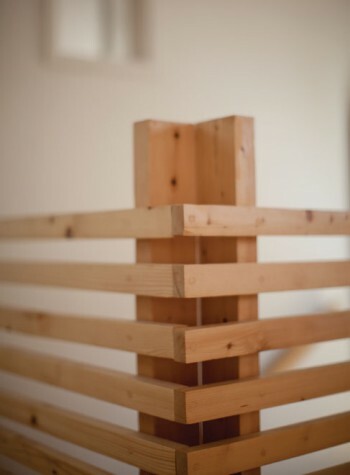 The two pieces of octagonal wood stacked in the foreground are left over from the home’s exterior posts. The rocking chair is by Danish designer Hans Wegner. The sofas are Swedish, and the floral pillows are Ekelund from Simply Scandinavian in Portland. On the far wall there is a drawing by Haines. 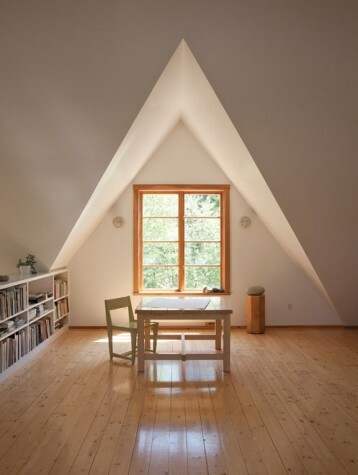 A large upstairs room has a sharp ceiling angle to accommodate a gable. Haines designed the birch table, which was made in Sweden, to match the dimensions of a window in an earlier home. The chair is Portland-based Furniturea’s “Bench Chair.” The stairwell to the ground floor is to the left of the low bookcase. A detail of the central staircase, which was inspired by stairs at Stockholm’s Swedish Museum of Architecture. Haines thinks old bathtubs are the most comfortable. She found this one for sale in a neighbor’s yard. The curtain at the left hides a laundry area. 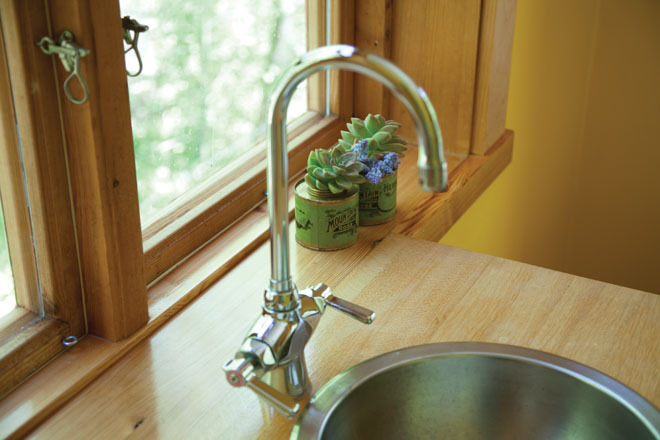 Haines says Chicago Faucets are durable. “They never break.” She used them throughout the home. The bathroom sink is intended for use in boats and was purchased at Hamilton Marine in Searsport. Succulent flower arrangements are by Emily Carter Floral Design. 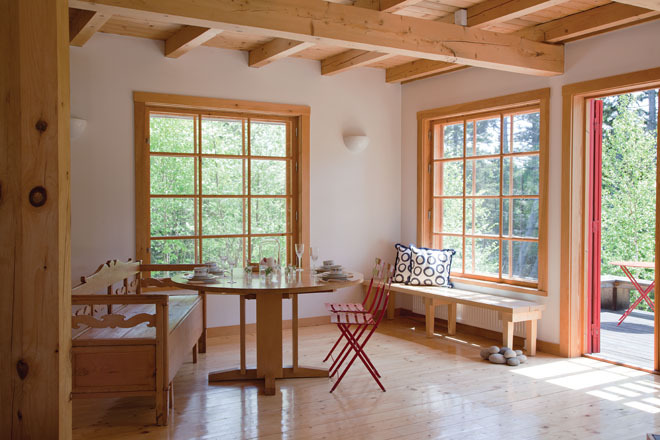 A dining room with double-paned windows from Sweden. The bench in the background was made by a Swedish friend. There is a deck outside. 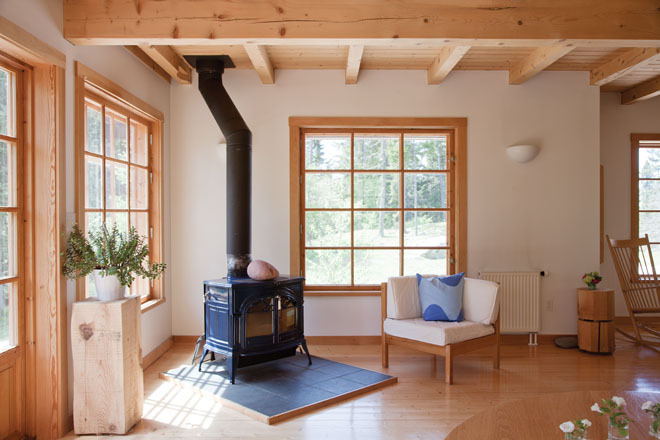 A portion of the living area with a wood stove. The square chair is part of a sofa set that can be divided into loveseats. The bed and table in this bedroom are from Haines’s grandparents. 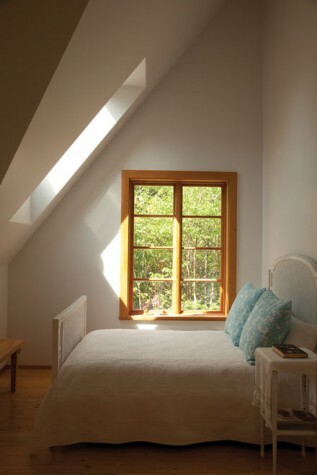 The bed is positioned so one can look through the skylight and see the stars. 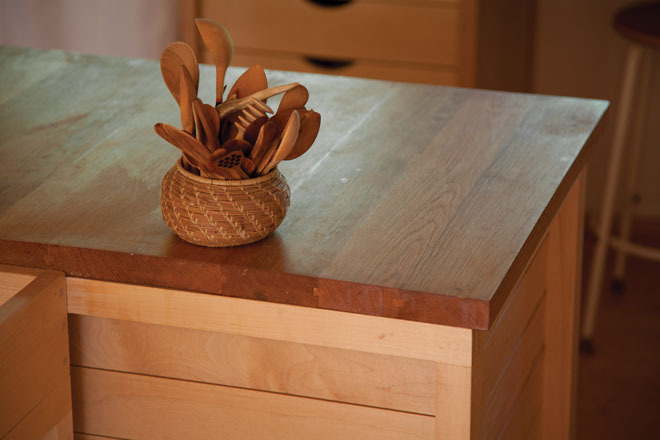 Haines and a Swedish friend built the cabinetry in the kitchen using wood left over from Haines’s sculptures. The table at the center pulls out six feet. Haines uses the extended surface to bake Scandinavian cakes and decorative breads for the Stonington Farmers’ Market. 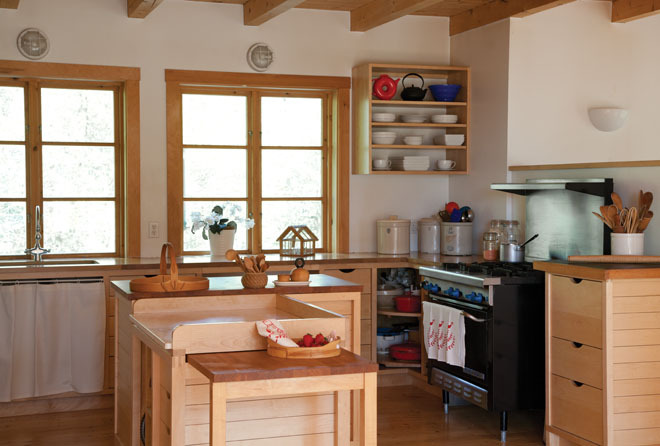 The drawers to the right of the stove serve as Haines’s recipe file. The tea towels are hand-printed in Maine from the Madder Root line. 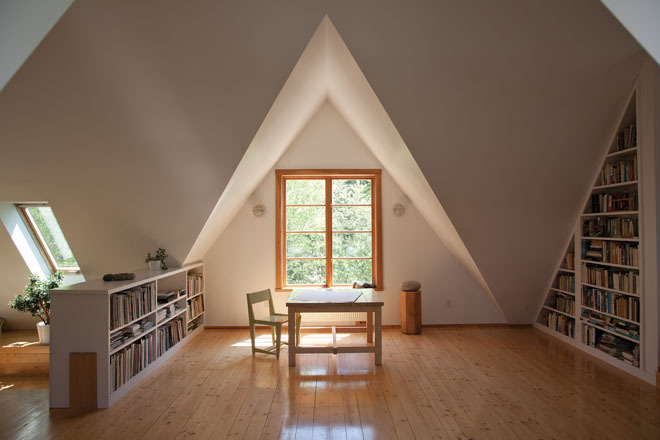 Scandinavian vernacular in a Deer Isle artist’s home. In the fall of 1998, Kenna Haines—an artist who goes by Kendra Ferguson in her professional life—came to Maine to see a good friend. When the two went out for a walk, Haines mused about where she would locate herself next in life. She was ready to leave Cambridge, where she’d lived for 22 years, and she had had enough of city life. “Come here,” her friend said. “It’s where you want to live.” Haines knew it was true. She had had a special feeling for Maine ever since she first visited in the late ’60s. Back then, she’d camped by a small cove near Lubec. In the morning, she awoke to discover that “the cove wasn’t there,” as she puts it. Haines had been raised in Montana and lived, at the time, in New York City. The disappearing water was her first experience of tides. 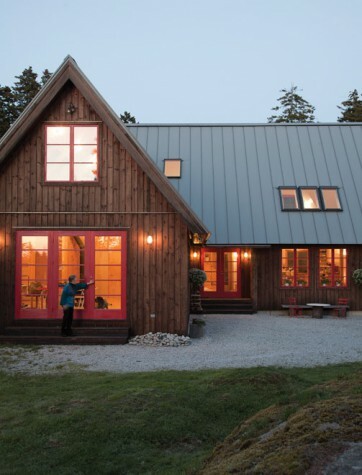 Haines had renovated many houses over the years, so she’d assumed she’d do the same in Maine. But when she went looking for houses, nothing seemed right. She decided to build a new home. After much searching, she found seven acres on Deer Isle’s Wing Cove. Encompassing forest, meadow, and a granite ledge, the lot had dramatic outcroppings of rock, including 12-foot-high boulders that led to the water. Haines knew that this was the spot, in part because the land reminded her of Sweden, where she’d lived, off and on, for nine years in the ’80s and ’90s. “I discovered I wasn’t quite through with Sweden when I came to Maine,” she says. The country hadn’t just once been her home. It was whence came members of her paternal family, including her great-grandmother. Haines consulted architects but eventually realized that she couldn’t use another person’s plans for her home. What she wanted, she says, “was to live in my own drawings.” Not to live, of course, in New York’s Metropolitan Museum of Art or Boston’s Museum of Fine Arts or the Yale University Art Gallery—although her drawings are in the collections of all three—but to occupy spaces that have the same elegant, simple lines as her artwork. 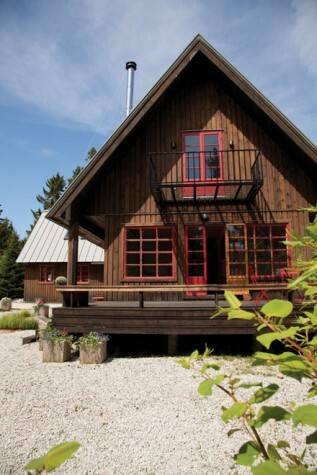 For years, Haines had been collecting clippings of architecture she admired, so once she purchased her land she sat down at a tea table with an old friend, and together they drew what she wanted: an L-shaped structure that has the basic profile of a contemporary Danish house but that also references the farmhouses of Scandinavia. As built by Michael Gray of Blue Hill and finished by Lewis E. Eaton and Son of Little Deer Isle, the house now has many Scandinavian features. 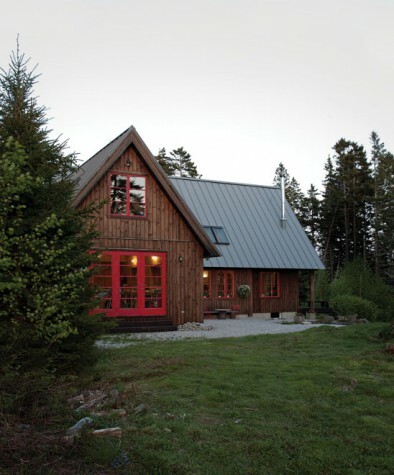 The roof is steeply pitched to mimic a Danish roof, but instead of the traditional tiling, Haines chose a galvanized aluminum standing-seam roof with skylights. 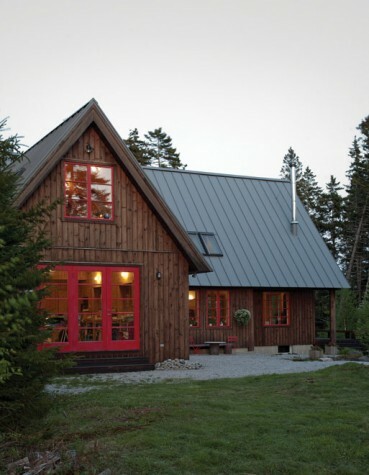 The house is clad in reverse board-and-batten siding, a style that originated in Norway and Sweden, and the exterior window frames are painted red, both because Haines likes red (as anyone who has seen her supremely spare drawings will know) and because Swedish homes sometimes have windows painted in a color that contrasts with the exterior sheathing. Swedes might also have cobblestones surrounding their house. Haines has gravel. (“I am not a gardener,” she admits.) Where the gravel leaves off, the woods begin. “I am very much concerned with fenestration,” Haines says. She prefers mullions to uninterrupted plate glass, because “mullions basically cherish the landscape” and also scale the world to a human dimension. 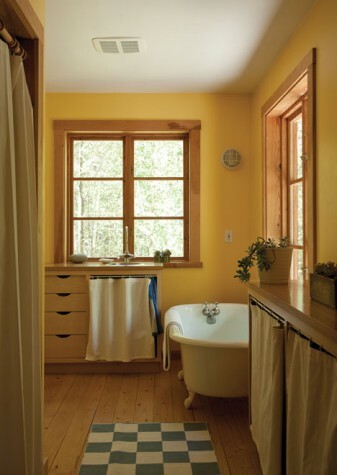 Haines had renovated a house in Sweden that made use of well-insulated, double-paned Swedish windows, and she looked for something similar in the States but couldn’t find it. Eventually architect Eric A. Chase of South Brooksville, who helped her complete her designs for the home, encouraged her to have windows shipped from abroad. In the end, a carpenter from Norrland, Sweden, made the windows, and Kurt Lidgren, a Swedish friend, made the exterior doors, which were shipped to Portland. 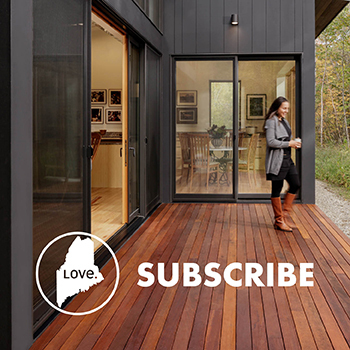 In addition, Lidgren came to Maine to work with Haines to build maple and oak kitchen cabinetry of her design. 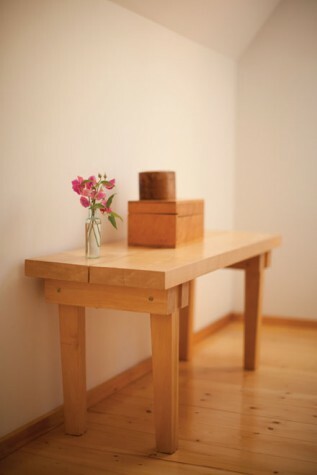 Lidgren and Haines are also responsible for a birch table and benches, built in 1988 in Sweden to match the proportions of a window in Haines’s home there. The beams in the living room and the wood sheathing in the studio, master bedroom, and pantry come from spruce milled on the property. 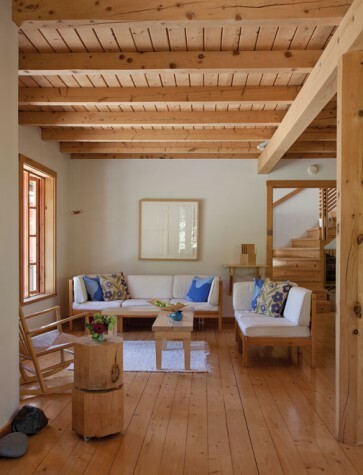 Inside, the overall airiness of the Deer Isle home feels typically Scandinavian, with its white walls, light-colored wood, and simple furniture, including Swedish sofas and a rocking chair by Danish designer Hans Wegner. 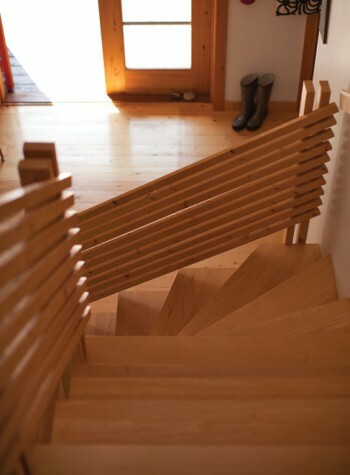 The main set of stairs was inspired by a design that Haines saw at the Arkitekturmuseet, or Swedish Museum of Architecture, in Stockholm. Even the kitchen’s wooden utensils and platters are Swedish inspired. Fittingly, Haines uses her kitchen to bake Scandinavian cakes and decorative breads for the Stonington Farmers’ Market. Haines’s house is very much that of an artist. Her work is exhibited here, stored here, and created here. At present, her studio space is in one wing of the house, but her rooms often change function. What is now her bedroom used to be her drawing studio. Her current sculpture studio has been used as an office, cabinetry shop, guest bedroom, and sewing room. 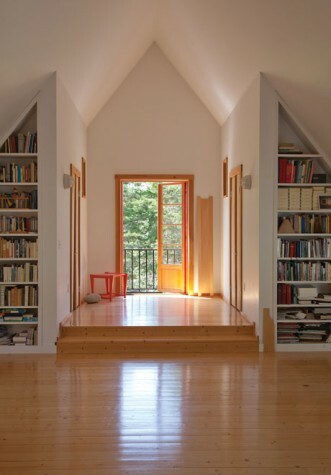 One of the most remarkable spaces—a bright upstairs room with a high triangular ceiling that accommodates the pitch of the roof—has served as library (thanks to built-in bookshelves), bedroom, stage for home concerts, and wedding celebration space. Haines said she wanted to live in her own drawings, but she could as easily have said that she wanted to live in her own sculptures; both her home and her three-dimensional pieces reflect her interest in materials, surfaces, rhythms, and unusual angles. In a 2006 talk she gave during her exhibition Rarely Simple at the Center for Maine Contemporary Art in Rockport, Haines described her sculptures of planed and finished hardwood as “compressing stillness into quiet meditations.” Her home’s bedrooms offer the same chance for contemplation. 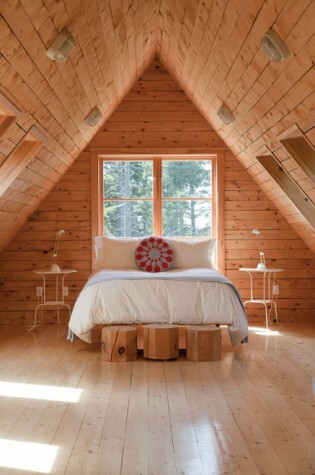 They are unadorned plastered or spruce-clad rooms, each dominated by a bed that is positioned to face a window or skylight. Lewis Eaton & Sons, Inc.